Posted on Wednesday, September 12th, 2018 in Commonly Asked Questions, Custom Design. What does custom designed jewelry mean? Custom design refers to any jewelry piece that has been created to match your specific wants. Whether that means creating a piece from scratch, or transforming old jewelry into something new again, custom design allows you to create a one-of-a-kind jewelry piece made especially for you. Why should I have a jewelry piece custom created? Sometimes, you envision yourself wearing a particular jewelry piece but cannot find it anywhere in stores or online. Or you may like a certain piece except for one aspect about it. When you work with a jeweler that specializes in custom design, you’ll be able to create the exact piece you’re looking for. What if I’m not sure what I want my custom designed jewelry piece to look like? We’ll show you lots of examples of jewelry so that you can get a better idea of what you do and don’t like. We’ll also ask some questions to get a better sense of your jewelry style. What is the custom design process? If we’re creating a new piece from scratch, we’ll typically begin with a CAD (computer animated design) based on what you’re looking for. We’ll then make any necessary changes to the CAD and once the final CAD design is approved, we’ll create a wax model so that you can get a better idea of its overall size and appearance. After you approve the wax model, we’ll give our goldsmith the go ahead to create your new jewelry piece! Can I use old gemstones to set in a new, custom created piece? Absolutely! We know that old jewelry can be sentimental, so we love creating new pieces using gemstones you may have inherited or have lying around. We can also scrap the precious metal from any outdated jewelry pieces and use that money towards the new setting. Does custom design cost more than buying an already-made jewelry piece? Not necessarily. Some jewelry designers charge a high premium for their jewelry. Because of this, we can typically create a similarly designed piece for less than the cost of the original designer. So having a jewelry piece custom created can actually save you money. However, it’s also important to note that more time and effort is required for creating a custom jewelry piece, which adds a little extra cost to the final product. To make sure you’re not overpaying for jewelry when you don’t have to, we always check with all of our go-to jewelry designers before creating a custom piece. If one of our designers already has a piece that is very similar to what you’re looking for, we can save you some time and money by purchasing that piece and making any small adjustments as needed. Only when we have exhausted all of our resources do we begin the custom design process. How much does it cost to have a jewelry piece custom designed? It all depends on much metal is needed for the jewelry piece, the quantity and type of gemstones required, and how elaborate the design is. We always provide courtesy estimates before beginning a custom design project, so you can decide for yourself whether or not you’d like to continue with the custom design process. 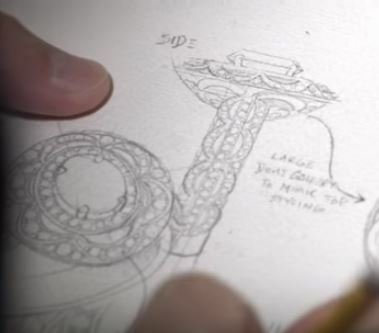 How long does it take to custom design a jewelry piece? It typically takes 2-5 weeks to custom create a jewelry piece. Do I have to schedule an appointment to discuss my custom design project? No, you can stop in anytime during our normal business hours to begin the custom design process. However, we highly recommend meeting with our custom design specialist and owner-extraordinaire, Karin. If you’d like to make sure she is available when you plan on coming into the store, we encourage you to give us a call beforehand. What should I bring to my initial design consultation appointment? If you have any images of jewelry pieces you like and wish to incorporate in the new design, bring those in. Also, if you plan on using any gemstones you may have inherited or have lying around, bring those in as well. We’ll need to measure them in order to determine the appropriate size for the setting. If you don’t have any gemstones or are not sure yet of the exact design you want for your jewelry piece, just bring in yourself and we’ll happily guide you along the custom design process. If you have any additional questions about custom design or would like to schedule an appointment, call us at 414-276-2457 or email us at info@kloiberjewelers.com.